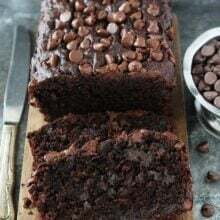 This easy Chocolate Zucchini Bread recipe is moist, chocolaty, and will remind you of your favorite chocolate cake. You will never know it is made with a vegetable! First of all, thank you for your overwhelming positive response to our BIG news! We are SO excited and hope you will all join us! Tis the season for lots and lots of ZUCCHINI! This is my favorite time of year because I LOVE zucchini, it is one of my favorite vegetables. I love zoodles, eating zucchini in salads, grilling it, and baking with zucchini. You can find my favorite zucchini recipes here. I recently made the most epic Chocolate Zucchini Bread and it’s definitely going on the favorite list. It is the BEST! It will remind you of my Chocolate Banana Bread…if you’ve made it, you know it is AMAZING. This version is made with zucchini and it is just as good! I don’t know who invented baking with zucchini, but they deserve a medal. If I could meet them, I would give them a giant hug. Zucchini in baked goods is genius! Baking with zucchini is probably my favorite way to enjoy zucchini because you all know I have a major sweet tooth. BUT you don’t have to feel guilty about eating a sweet treat when zucchini is involved because you are eating a vegetable! 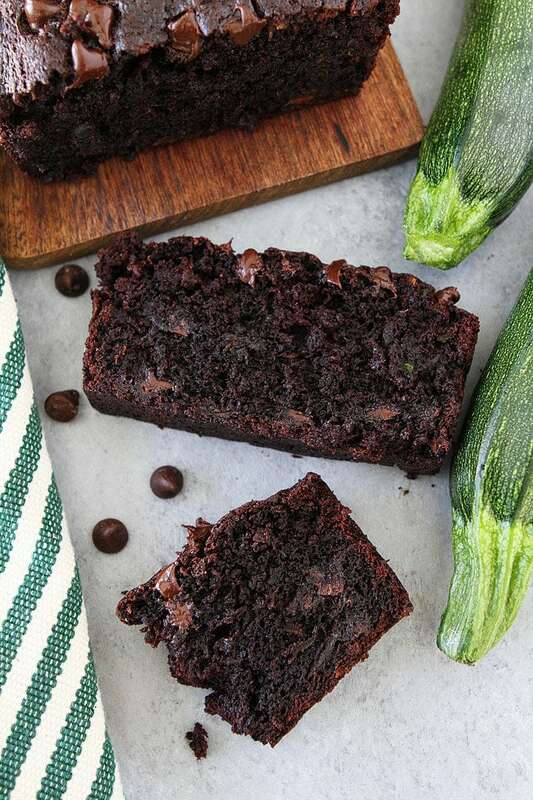 This Chocolate Zucchini Bread is guaranteed to be your new favorite zucchini recipe. You will be begging your neighbors for more zucchini so you can make multiple loaves of this bread. It is crazy good! So what makes this Chocolate Zucchini Bread so good? It is made with cocoa powder AND chocolate chips. Double the chocolate, double the fun! There are chocolate chips in the bread and on top! The bread is super moist. I use eggs, melted butter, oil, and zucchini. All of the ingredients come together to create a flavorful and moist bread. 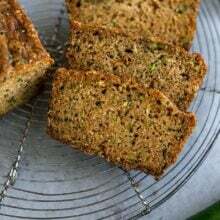 The zucchini bread is easy to make. You don’t need a mixer and can have it in the oven in no time. Your house will smell amazing while it is baking. 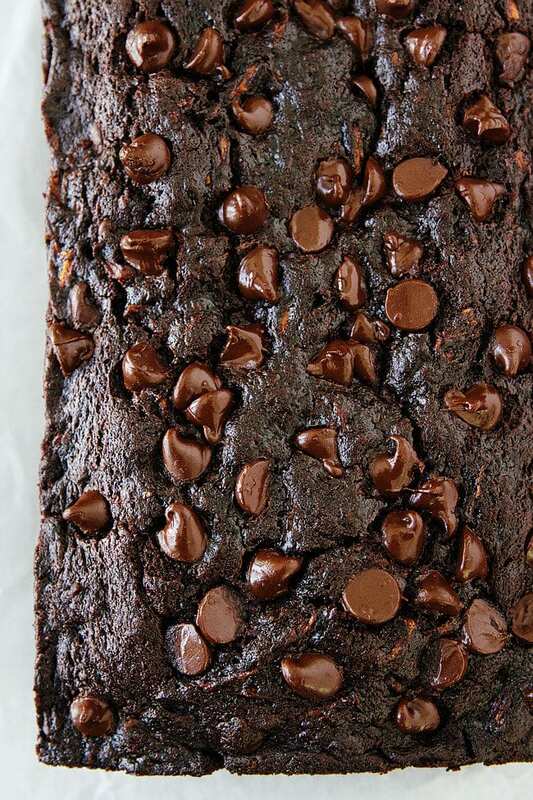 You are going to fall in love with this Chocolate Chocolate Chip Zucchini Bread! Even if you think you don’t like zucchini, make this bread. It will change your mind. Zucchini has never tasted so good! 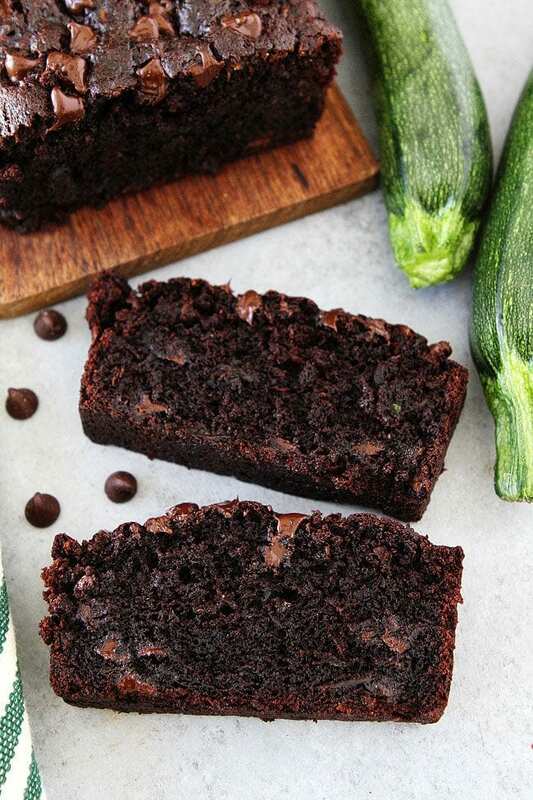 This easy chocolate zucchini bread will remind you of your favorite chocolate cake! I had a friend in University who used to make this and it was SO GOOD. I completely forget it existed until this post – I will be making this for the hubs this week for sure! What a delicious way to get my chocolate fix! I’m definitely making this! I can image this recipe would make really good brownies too… the zucchini would keep everything deliciously moist. Thanks for sharing! YUM! This looks like chocolate HEAVEN! Did you squeeze out the water from the zucchini? No, if your zucchini is super watery you can squeeze it out a little. You want the bread to be moist though. Now you’ve got me wondering who really did invent baking with zucchini! Ha! Thank goodness because life without this bread would be sad. I can not even handle how good this looks!!! I must make chocolate zucchini bread asap! I looooove chocolate zucchini bread. The first time I tried some the fantastic world of zucchini in baked goods was opened up to me. I have a vegan person in the family. I have made cakes with yogurt instead of eggs and they come out great. Has anyone tried that with this recipe ? I would love to make it. I am sure flax eggs would work well. Right, I suggested they use flax eggs. There’s so many different yogurts that actually are vegan so I am assuming they must use those. I get them for my son. Mashed banana instead of egg is really good! Look up aquafaba as an egg replacer! My son is anaphylactic to eggs. You can use the liquid drained from canned garbanzo beans. You can also buy powdered aquafaba. I also use EnerG Egg replacer – you can order online. I am definitely going to try this! I have made one before and it was overly batter like even after it was cooking. Almost had a raw feeling. Does this have a similar texture? No, the bread doesn’t feel raw:) It is moist, chocolaty, and SO delicious! This recipe a lot like one my Mom has made for several years, The only difference is she also adds shredded coconut. She refers to it as a cake, It also freezes well,. Everyone loves it. About to try this now! Have you ever subbed applesauce for the oil in this recipe? No, but I bet it would work. Let me know if you try it! I did! My bread wasn’t as moist as I expected. Not sure if it was the applesauce or because my zucchini was huge and not super juicy. I’ll try again with the oil and see how it is. Was still delicious! I haven’t tried the bread with applesauce. Glad you still liked it! I have natural cocoa. I’ve read that natural cocoa works best with baking soda as a leavener. Can I use my cocoa or should I only use Dutch process? Thanks! You can use regular cocoa. I know others have tried it and it works fine, I just like the deeper flavor of Dutch process. Enjoy! How many zucchini go into a cup and a half? Eager to try this! I’ve had this before and what a non-guilty pleasure. Thank you. 1 large or two small should get the job done:) Enjoy! I didn’t know how many zucchini either – I bought 4! oh well, I’ll use the other 2 in something else or another loaf of the bread! This was delicious! You would never know there was zucchini. I mixed some dark chocolate with the semisweet. I love zucchini everything – this looks so decadent and delicious! This was delicious and will definitely be going into the rotation!! What happens if you use coconut oil and don’t melt it? I used coconut oil that’s liquidy from the heat in my pantry but I didn’t ‘melt’ it in the microwave. Not sure how it will turn out…. I added some walnuts! This is by far my favorite zucchini bread recipe yet! A GREAT big thank You! And my co-workers are in for a treat on monday. Yay! You are nice to share, ours never lasts that long..ha! This looks great! Our zucchini plants aren’t producing much this year but our summer squash is going crazy! Do you think yellow summer squash could be substituted? AMAZING! Tastes just like chocolate cake! We enjoyed this delicious bread tonight. We live in high altitude (6200ft) and, thankfully the bread had no problem rising and baking all the way through with no adjustments! It was moist and balanced. I accidently left out some of the brown sugar when I doubled the recipe, but the sweetness from the chocolate chips sufficed. My husband is not a fan of “cake,” and while this has a cake feel, it is easily hidden under a scoop of vanilla ice cream. Win for sure. Thank you. I would like to try making this as muffins. Do you think it would work? Yes! Just adjust the baking time, probably 20-25 minutes. Hi, I made this tonight and it tastes great but I had to add some liquid to the batter because I could tell it was too dry. Do you think it’s just due to varying levels of liquid in zucchini? I triple checked all the ingredients I used and didn’t leave anything out. The zucchini should moisten up the batter quite nicely. Don’t squeeze out the liquid in the zucchini. It is a very moist loaf. Absolutely love your recipe chocolate zucchini bread! I will definitely try this yummy dessert cuz I’m vegetarian! Thanks a lot for sharing, Maria nad Josh! hi- can i use either Ghirardelli’s sweet ground chocolate & cocoa, or Hershey’s unsweetened cocoa for the dutch process cocoa? I get these cocoas mixed up! I’m going to try this. Can you add walnut. Walnuts would be good! Enjoy! Can you sub for a gluten free flour?? Could I do muffins instead of bread? Sure! Make sure you reduce the baking time. Can you substitute almond flour for regular flour? I haven’t tried almond flour, but a gluten free all purpose mix works well. Can you tell me how to make this with almond or coconut flour? I do not use regular flour (low carb). Thanks. I am not sure about almond or coconut flour, it might make the bread a little dry? I have used a gluten-free all purpose mix and it worked well. I have been told that the almond flour has more moisture in it and the coconut soaks up more moisture. I guess I will need to play with it a bit. Do you peel the zucchini before it is shredded? I never peel the zucchini. No need to! 375 for 1/8 of the loaf. I made for the first time and it is wonderfulerful. Moist, flavorful, delicious and easy, whats not to love! Recipe looks awesome! Would love to try. But I have a question. Have you ever used gluten free flour, Almond or Rice flour for this recipe? Sorry for above question. After I posted it, I read other comments and saw same question was answered. I would like to make this for my grandson who is dairy and gluten intolerent. Will substitute flour for glutten free, but what about the butter, can I substitute crisco for it? I get the dairy free choc chips, no problem there. Thanks for your help. I would use all coconut oil or canola oil. My kids can’t have dairy and I used a non-dairy, no-soy butter substitute for the bread and it worked great. Made this recipe this afternoon…so divine…everyone loved it. This recipe looks AWESOME! Could you tell me if it would be OK to put some walnuts in there are well? have just found this recipe on facebook and realised that i had all the ingredients and made it right away!!! its in the oven now! cant wait for it to be done!!! Yes, you can use Hershey’s special dark or unsweetened cocoa. How many calories per slice???? If I wanted to make mini-loaves, how many do you think this recipe would produce? BTW, made this recipe last night. Incredibly easy and sinfully delicious! I’m already figuring out how I can beg for more zucchini today. Love this! My Party pan squash plant is growing like crazy. I wonder if I could use that in place of the zucchini? I haven’t tried it, but I bet if you shredded it, it would work. Let me know! Could you please tell me whether to use sweetened or unsweetened Cocoa? I would check the loaves at 30 minutes to be safe. 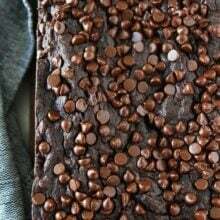 Can you use Hershey’s cocoa powder instead of Dutch process cocoa? I made this yesterday and it was phenomenal. It was so good that I baked a second loaf in less than 24 hours. One of the best parts was that my family never realized that it had zucchini in it…I wish you could’ve seen their faces when I told them. Thank you for the recipe. This makes us so happy! So glad you liked our recipe. Can I substitute I can’t believe it’s not butter for unsalted butter? I haven’t tried it. You can do all oil if you wish. OMG! Made this yesterday. Such a moist chocolate ‘cake’. Great light texture. I lined the bread pan with parchment paper so no need to grease the pan. Loaf just lifts out of pan, strip off parchmrnt and you have the perfect intact loaf for slicing. Amazing recipe! My answer above wasn’t meant as an answer to your question. Posted here in error as a regular comment on recipe. However to answer your question, I used margarine instead of butter. Still had a rich, moist chocolatey taste with amazing texture. Looks delicious but zucchini is actually a fruit. Can you use any kind of baking cocoa? I am not sure we have Dutch Cocoa in our stores here in town. Thank you. Anyone ever made these as cupcakes instead? I do not own a loaf pan. What would be the temperature and time for cooking? You can make cupcakes. Same temperature and check them at 18 minutes, just to be safe. Do you think this will work in a 9 x 13 pan? I don’t think there will be enough batter for a 9×13 pan. If you use salted butter you can use adjust the salt a little, but you will still want to add some salt. Only one cup of flour?? I made two loaves yesterday and I’m a believer! This is fantastic zucchini bread! But my stirred up much think than shown in the video (before adding the zucchini). I followed the recipe to the letter. Any ideas why, or fixes for it? This caused it to require a longer bake time. Also, DEFINITELY use zucchini that is still very moist. I had shredded and drained mine the day before. I think I’d have had more success with freshly grated squash. I always shred the zucchini while I am making it, so maybe that is why? I never do. If for some reason your zucchini is REALLY watery, you can squeeze it out a little. Hi can I make in four small loaf pans instead of one? Sure, just reduce the baking time. I am not exactly sure because I haven’t tried it. I would check them at 30 minutes to be safe. I will be making this recipe as soon as it gets cooler here. I was wondering how many you can bake in the oven at one time? Do you have to increase the baking time if you bake more than one? You can bake two loaves at a time. It should be about the same time. Put them both on the middle rack. Made the chocolate zucchini bread. It was awesome! Wonderful! Not super sweet like other recipes. Will make this at the holidays! Great gift for the holidays! Glad you liked it! Do you happen to know how many calories are in a slice? Looks delicious!!! I have shredded zucchini in the freezer. Do you think I could throw it in the batter frozen, or should I thaw it and drain some of the liquid! I haven’t tried adding in frozen zucchini. It might have more moisture. Let me know if you try it. If you are worried, you could thaw it and squeeze out some of the liquid in paper towels. Let me know how it goes! Problem with these internet recipes you never include high elevation changes so these won’t work where I live. I made this incredibly easy chocolate zucchini bread last night with a zucchini I needed to use. I had all of the needed ingredients in my pantry which was wonderful. It was so easy to prepare and bake. I made 2 loaves so I could put one in the freezer for later. The first one is half consumed already. My husband told me it was wonderful and he loves it which means I will definitely make it again. I give it a 5 star rating for ease of making and taste. So happy you liked the bread! Thanks for letting us know! This was OMG delicious!! 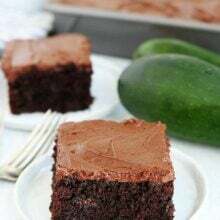 Moist chocolate cake with zucchini no one would ever know.. honestly so good I’m making It again today to give to a neighbor. This came out delicious! I will def use this as my go to zucchini bread! I added two cups of zucchini and only had nestle cocoa on hand so to elevate the chocolate flavor I added a tablespoon of instant coffee. I also used mini semi-sweet chocolate chips. I just prefer baking with mini chips… Thanks for sharing!! Yum!! I made this (with the coconut oil option) this morning with our garden zucchini and it is delicious! Not as sweet as my husband’s zucchini bread, so I didn’t need to skimp on the sugar and chocolate chips the way I did. Will remember next time! Enjoying a slice with a glass of milk right now! I loved it!. Specially because it’s a way my children can eat zucchini they loved it so much!. Very easy to make. I thought is was a little dry but I squeezed the water out of my zucchini, maybe a little too much! The kids loved it and so did their friends. Several have asked for the recipe! Are the nutritional stats posted somewhere? I don’t need it all, just calories, fat, carbs, sodium, and protein per serving. Luann, did you use regular or dutch processed cocoa? If you can’t find Dutch process cocoa, you can use regular unsweetened cocoa. Yes, 1 cup of flour. Do you chop or shred the zucchini into small pieces using a food processor ? You can use a food processor but I usually use a cheese grater so I don’t have to get out my food processor. Where do you purchase Dutch process cocoa? I buy it at Orson Gygi in Salt Lake City. Some grocery stores carry it. I know you can buy it on Amazon too! Only ONE cup of flour? I subbed with all purpose gluten free flour and it turned out soooo yummy! I made 3 loaves tonight because I figure if they were as good as they look I would need 3. One for the family, obe to take to a party and one to give away. Wellllllll…. I coukd gave made 6 and it wouldn’t be enough! I even told my hubby about having ice cream on top! This is a big hit that will be a family favorite for years to come. I wonder if a mashed banana and a few blue berries would be good mixed in as well. It was good but a little rich..if that can truly be! It was good with vanilla ice cream. Just put it in the oven, I doubled it so I would have one to enjoy and one to have at a later date. Super easy to make. Is there nutritional content available? I am looking for things to give to my daughters swim team for healthier in season snacks and this sounded great! I don’t have the nutritional info, sorry! Hello! I don’t currently own a bread pan will a cake pan work for this? I haven’t tried it in a cake pan. An 8×8 pan might be ok, but I haven’t tried it. Do you have the nutritional values for this recipe? ITs so wonderful!! I don’t, sorry! You could plug in the info in an online tracker. This is incredibly delicious. My sister always raises an abundance of zucchini, so I was eager to try this for a carry-in dinner. It was a hit. I added a cup of chopped Pecans. And put it in a 9″ square pan. I baked it for 30-35min. I’m making it again today! I made this today and it came out great! Heavenly. No one would know there is zucchini in it. I plan to serve it to my son who has. PT eaten zucchini since he ate baby food. Oops, I should have proofread…gave it to my son who has not eaten it since he ate baby food. I made this to take to the lake with the family for the weekend and everyone loved it!! It was good right out of the oven but even better the next day. I will for sure be making this again! What an awesome recipe! Had an abundance of zucchini from my garden and I made 7 loaves!! So delicious and super easy to make! Do you need to cook the zucchini or peel it first? No! Just shred and add it in! Can I use all butter instead of oil? Thanks. So i dont have brown sugar or chocolate chips, i guess I’ll try with the rest of ingredients lol thinking about using white chocolate chips its all i have. Hi, could you sub sweet potato for zucchini? I made this a week ago for a small group of women who devoured it and the oven is warming up now to make it again for my daughter. on this decadent “cake” bread. Thank you so much for sharing this recipe. I will be making it for the rest of my life! You are welcome! Glad it was a hit! do you think i could sub all purpose flour for coconut flour? I love it!! I’m going to make a lot more! Question can you freeze this bread and it still be as moist ? Could I use mini loaf pans? Sure! Just reduce the baking time. Super delicious ! Somewhere between cake and brownies. I made it into 3 mini loaves, about 1 cup of batter per pan, and baked 48 minutes. Looking forward to making more and sharing it. Really love this recipe! Made a double batch last night and the family loved it. The bread has an intense chocolate flavor and is really moist. The flavor is so good that next time I make it I will increase the zucchini as you don’t even taste it. This recipe is definitely a keeper! Thanks for letting us know you loved the bread! This is a delicious and easy recipe–and a terrific way to use up the Zucchini that seems to grow overnight in the garden. I would not consider this a ‘healthy’ bread-but rather a decadent way to eat zucchini. I made it once in the loaf pan, and then doubled the recipe and made it in a 9×13 pan for a birthday cake (of course I frosted with a mocha frosting). I used the coconut oil. This bread is superb!Decadent chocolate-y deliciousness. Just made it and it was gone before it could completely cool down. This recipe is a keeper! Thank you for sharing. I love that i can taste the sea salt in the bread! I love sweet and salty ( i only had salted butter so maybe thats why it stands out more?) But yummm! Second you have have overmixed or overbaked because this bread is unbelievably moist! Glad you like the recipe! Thanks for letting us know! So yummy. Thank you for this recipe. My family loved it. We were thinking it would be good with whip cream on it!! Made this tonight and it was so good!! Even my 2 Zucchini hating kids loved it and asked for seconds! Of course, they didn’t know there was even any Zucchini in it- lol I plan on making this again- Thank you for the recipe! I tried this tonight and it was lovely! It really was more like cake than a bread 😉 . But the texture is heavenly–very light and moist! Doesn’t feel as rich as eating cake, which is much appreciated. yummy. moist. delicious. kids loved it! WOuld you mind converting into grams for a Scotsman? This s so tastey. It was a big hit at the cottage. Try adding mint chocolate chips. I was told it tastes like the chocolate mint Girl Guide cookies. Could I do all coconut oil instead of butter? Very good. Picked this recipe because of the high ratings. Did not disappoint. Yes, you can use unsweetened cocoa or Dutch process. I made this chocolate zucchini bread and it was sooo good! Oh…..my…..GOSH!!!! This is the most delicious chocolatey creation EVERRRRR! Glad you liked the bread. It is my favorite too! Oh…..my…..GOSH!!! This is the most delicious chocolatey creation EVERRRR!!! I made this delicious treat this afternoon, OMG, it’s to die for!!! Surprised my family with this one. They were stunned when I told them it had zucchini in it. I will make this one again. It was super easy and delicious!! First time I baked this I made the mistake of squeezing out the zucchini… baked 50 min and it was burned. Got on the blog to read the comments and went DUH… not supposed to squeeze the water out of the zucchini. Oops. Tried another loaf tonight and it is yummy and the batter was a much thinner consistency. I ate it with a scoop of vanilla ice cream. YUM. LOVE LOVE LOVE this recipe. Easy to make – moist and delicious!!! Can never go wrong with chocolate AND chocolate chips. Can the recipe be doubled? I am sure the first loaf will barely make it out of the over before it is scarfed down. OMG!!! THIS IS DELICIOUS!!! I was given a huge zucchini by a co-worker and found your recipe! AAAAAMAAAZZZZING!!! I have passed your link on to everyone I know!! Read under directions. The very first line says “Preheat oven to…” Yes the baking temp is in the directions. I’ve made this twice and it is sooo delicious! I wonder if I could add some teaspberry jam to it? And if so would I have to add some flour to balance it out? I think should have 5 stars I font know what I hit. This recipe is a keeper! This bread is delicious and fudgy. We loved it and it made our house smell great! This bread is delicious! Super moist and so rich in chocolate. I made it last night, and couldn’t stop sneaking a bite here and there when it was still warm. My fiancé tried it this morning, and he loves it as well. I had a really juicy zucchini (defrosted from my freezer), so I skipped the melted butter and just upped the oil to 1/3 cup. It was still totally rich and decadent. Definitely going to remember this recipe next time I have zucchini on hand! do you need to squeeze the zuchini to get out the extra moisture? I don’t. If your zucchini is REALLY watery you can squeeze it out a little, but you want the moisture for the bread. I made this last week and it is DELICIOUS! I used the coconut oil option, too. SOooooooo good. Thanks! I would like to try this recipe but make it into the 4 smaller loaf pans. How would you recommend I adjust the baking times to accommodate the little pans instead of the one big pan? I would check them at 25-30 minutes to be safe. This is a fabulous recipe everyone loved it. No one would even know there was zucchini in side of it. It was just amazing I make it over and over for my family. This is the best recipe I ever tried from the internet !!!! But,I had an over-abundance of spaghetti squash and I thought I would use it instead of zucchini. Guess what? It was GREAT !!!! I made this last night. It was quick, easy and no fuss. I took it to work and everyone loved it. Not too sweet which is perfect. I was worried about it being too rich, but that wasn’t the case. You can’t really see or taste the zucchini, but then again zucchini doesn’t have much of a taste anyway, but does add moisture to the loaf. This recipe is a winner! Incredibly delicious & easy to make. I tripled the recipe & made a large loaf, a small loaf, and 24 muffins. Moist, chocolatey, decadent! 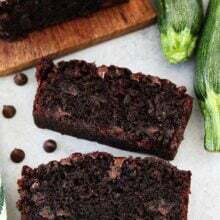 Ooh la la we loved this chocolate zucchini bread! It was a hit, thank you!! I doubled the recipe because I was gives a giant zucchini. I have made this so many times, because people keep asking for it. I always use chopped walnuts in mine. Absolutely delicious. Made this bread the other day, it was awesome! Moist, not too sweet, but seriously rich, chocolatey-decadence. Better than a chocolate brownie and more healthy! Hello. I made the Chocolate Zucchini Bread this past Saturday. Wow – it was beyond delicious. I followed the recipe exactly. It was moist, with a deep chocolate flavor. It was oh so good. And it was easy to make – which was a nice bonus. I prefer recipes like this where it doesn’t take an electric mixer, just a whisk and a spoon. Will definitely be making this again and again. Thank you for the fantastic recipe. Oh and also, I baked mine in a round non stick pan. It only needs 45 minutes for me in that. I am so happy you like the bread! Yay! Super moist!! Delicious. Will definitely make again! I made a vegan version this recipe by using two flax eggs and using 1/2 cup coconut oil for the oil/butter and everyone has gone nuts for it (even my very non-vegan friends). It is amazing!!!! Thanks so much for sharing! Turned out great! I made a double batch and it still turned out the way it should. This recipe is so delicious! Thank you for sharing it! My family loves zucchini and we always seem to have a few in the fridge at all times. I’ve made this countless times now and my family has requested it so much that we’ve gone through 3 loaves in one week! I really like how this recipe is versatile too. For a less sweet loaf, I fluctuate between decreasing the brown sugar to 1/2 cup or 2/3 cup and I increase the amount of shredded zucchini to 2 full cups. I also decrease the amount of chocolate chips to 1/2 cup or 2/3 cup of DARK chocolate chips. My family finds that these small adjustments are just the right amount of sweetness for my family’s tastes without being too decadently sweet. Thanks again for the delicious recipe! Glad you enjoyed the bread! Any experience using a sugar substitute instead of sugar? We loved your recipe. Thanks for sharing! I was wondering for next time do you think I can replace the flour with almond flour instead. If you don’t have the butter, can you add extra oil? Absolutely divine! Total winner recipe – this is always a hit. Hi!! I’m peruvian and Will try to make this Recipe. I would like to know what kind of loaf pan you used. How manny innches. Thank you for tour answer. We use this as a desert. It’s awesome! I’m making this right now. I have enough batter for three small loaves. I want to take one to a friend and keep two. Do you know what the baking time should be? Easy and delicious! The bread came out so moist with a slight chocolate flavor, not over powering. Glad you liked it! You can always add less chocolate chips. It will still be delicious! When your shredding the zucchini do you have to drain it or put it in the paper towel as it is a very watery type of veggie? I would not want to have this recipe be a flop! Thank you for all you hunt and delicious recipes!! You are using Dutch chocolate and baking soda??? I use it for this recipe and I think it is just fine. You can use unsweetened cocoa if you wish, but the bread works well with both. I made it with the soda, although they say you should use baking powder with dutched chocolate. It is very moist and oh, so, chocolatey. I still wonder what it would be like if I used baking powder instead, if it would raise more…. Absolutely delicious! I made this for my husband and he devoured it! Thank you so much for sharing this recipe. We had a number of scallop (patty pan ) squash from our garden. I used this instead of zucchini. This bread is incredible and easy to make. I added some macadamia nuts. No one can even tell that there is squash in it. This recipe is a keeper. Ooh, I love the addition of macadamia nuts! I made this recipe and only subbed in chocolate chunks and made them in muffin form (same temp, 25 mins). I also squeezed my extremely watery homegrown zuc. These muffins are chocolate cake and I’m forced to hide them from myself!!! Moist, super-chocolatey, yummy, delicious — can’t say enough in praise of this recipe. I made it yesterday and plan to make it again soon. Could this be made with chocolate, bananas, zucchini and coconut ? Or has anyone made it this way ? This cake is phenomenal. I safely doubled the recipe and it made two standard size loaves, three minis and 5 cupcakes. I understand applesauce, half vegetable oil. What a hit! Shorter baking time for the minis and cupcakes, of course. Amazing! We had previously tried a recipe for chocolate zucchini bread that used honey as the sweetener. The kids (who do not like zucchini) wouldn’t eat it. Not the same for this recipe. Wow! It’s absolutely fabulous and tastes just like chocolate cake. Thank you! Could I substitute gluten flour ap blend for the regular flour? My boys love it, they don’t know they are eating a green veggie..ha! Tastes just like a chocolate cake. We love this recipe. Thanks Maria and Josh! How would this turn out without the chocolate chips? still good, but I love the chocolate chips! Do you know what the sodium content is for 1 serving? I made this just yesterday and it turned out amazing. Thank you so much for this recipe. Made this – was simple and came out delicious even for a bad baker. I used whole wheat flour and dark chocolate chips to make it slightly healthier. Next time I may swap out the chocolate chips for walnuts to make it a nice weekend breakfast bread. Made this today its outstandinh ! Thank you! Do you know the nutritional value for this? I want to make this but I have regular hershey cocoa. Can I substitute? Have googled the Dutch cocoa and don’t have it yet. I made your lemon zucchini bread and it is wonderful. Sure! Glad you liked the lemon zucchini bread. I used just regular Bulk Barn cocoa, so I think any cocoa is fine. It turned out amazing, I also loved the Lemon Zucchini bread. SO good!!! I grew up with a mom who always made zucchini bread so I love using it in all kinds of recipes. Excellent !!!! So sweet, it should be cake. Perfect ratio of ingredients. 50 minutes was the exact timing that made this bread so moist. Yes, you can use your favorite all-purpose gluten free flour. Does it work with substituting almond flour for the all purpose flour? I haven’t tried almond flour, it might change the texture and flavor. I have tried all-purpose gluten-free flour and it works well. Delicious! Best of all – easy to make. Outstanding flavor… a must-have recipe for chocolate lovers. Rich flavor, very moist. Have made this recipe over and over again. Such an amazingly yummy chocolaty zucchini bread!! Love it. Excellent!!!! Thank you! My Grandbabies just loved them!!! No clue about the zucchini!!!! Delicious way to sneak some veggies in! My kids loved the rich chocolate flavor. So easy to make and so good. I froze some slices and they freeze beautifully. A few seconds in the microwave and it tastes like you just baked it. Thumbs up for a great recipe. By the way, I was short of regular chocolate chips and used the mini version on the top. This is a great recipe. It freezes beautifully. It is very chocolaty and so delicious. I have made a lot of zucchini bread, but this is the absolute best! It’s basically healthier cake. I used about half of the chocolate chips called for and it was perfect for my family; can’t wait to make more. So glad you loved it! It’s my favorite too! Can’t even tell you are eating your veggies! Made it for work, they scarfed it down and begged for more! Amazing! Made it once, doubled the recipe and made 3 8×4 loaves. Perfect! Shared the recipe with coworkers and they love it too. Just made it again, this time in muffins! Can’t wait! Very delicious! I followed the recipe. I think I’m going to try my secret add in that I use for many chocolate recipies next time I make it…which will be today! Delicious. Perfectly moist and texture is great. I might cut back on the cocoa just a bit next time as the chocolate flavor was a little overpowering. Thanks! How much is 1.5cup of shredded zucchini in grams? Just made this and it’s to die for. I’m wondering if I use the batter for muffins how long should I bake for? I’m new to baking and don’t want to ruin a batch! I can’t get Dutch process cocoa where I live. Is it okay to use regular cocoa? Absolutely delicious and so quick & easy to make. Worth doubling the recipe so as to share the wealth! I wrapped 3 halves in parchment paper and attached a recipe card with the recipe ( old school ) along with the twopeasandtheirpod website (new school) to give to friends. What changes do I need to make for high altitude?? I made this today and it was a hit. Nothing left. YUMMY!!! I made this and it was really delicious. It was also very easy to prepare. I would suggest that you really make sure the loaf pan is oiled well, especially on the bottom. My loaf tore 2/3 of the way down the loaf, leaving the other 1/3 in the pan. The great thing is that you can do a lot with this dessert!! Our plan is to melt Rolos over waffle shaped pretzels and then cut them up. Top the zucchini bread with a scoop of vanilla bean ice cream and then sprinkle the chocolate Carmel pretzels on top. YUM!!! This is amazing! The best zucchini bread i have ever tasted. I also made the zucchini, carrot, and apple bread. Didn’t taste that yet, froze two. I added golden raisins to that one…..smelled devine. I will surely post on my FB page! Love the raisin addition! Thanks for sharing! Made it yesterday. My husband and I love it! and he says he doesn’t like zucchinis. 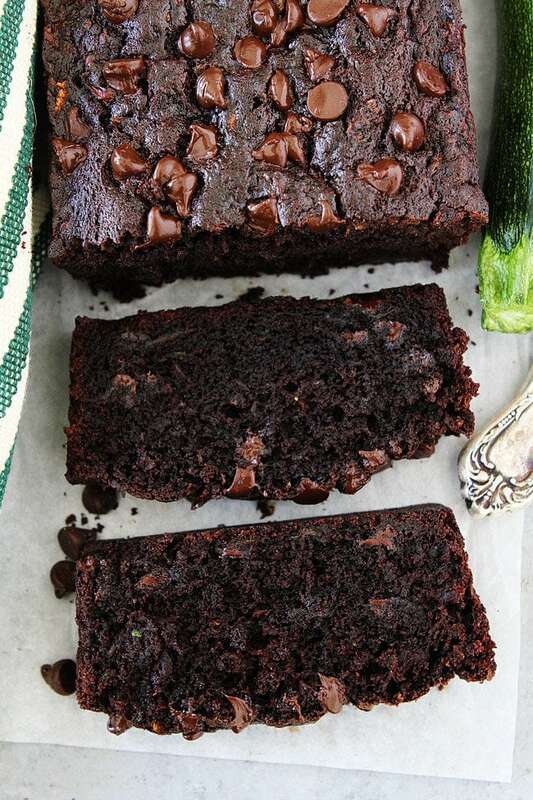 If you’re looking for the best chocolate zucchini bread recipe, this is it! I thought I had tasted amazing chocolate zucchini bread before; but, after making these, the other recipes pail in comparison. I made this into muffins, and they are extraordinary. Very moist, and very chocolaty. This has replaced my regular “go-to” chocolate muffin recipe. After making it as written, and devouring them very quickly, I substituted in honey for sugar and whole wheat flour for regular flour. That made me feel even less guilty eating 4 in one day. The original is obviously the best, though . Thanks for the recipe! I made this in the effort to get my 4 year old son to consume vegetables without actually knowing he’s consuming them. He loved it and ate 2 pieces without hesitation. I substituted with pumpkin, it was delicious! Great recipe! Thanks! My family loved this so much I had to make it again the next day because it was gobbled up. I had searched for some time to find a recipe that could replace the one I had in the recipe box that was lost when we moved (5.5 years ago), and while this one wasn’t exactly the same, it sure is close! My kiddos remember & love it so much that my son asked for it for his bday treat at school! It was so cool to watch a group of elementary schoolers freak out when they learned the “secret ingredient”! Haha! *EXCEPT* I make these as brownies! My zukes were HUGE (5+ lbs) & a little one the drier side, so I doubled the recipe, baked in a 13×9″ pan, and dusted with powdered sugar after cutting them! If they were more wet, I would’ve just used an 8×8″ and done several batch since they’d be more gooey, but this was perfect! I’ve made this twice and it was delicious both times! I got a bit nervous when the batter was too thick to pour, but the finished product had great texture. Oh my lanta!! This is a delicious recipe! I’m truly an awful baker and I was determined to make this work and I’m so happy it did! I used whole wheat flour and turned them into muffins. Thanks for sharing a great recipe. I made this and it was absolutely phenomenal! I wouldn’t change a thing. We finished it in 3 days… it was just that good!! I just made this based on the reviews. It is absolutely the best chocolate zucchini bread I’ve ever had. It is very moist and does taste just like cake. It was a huge hit with the kids. Thanks for sharing. I’ll be making this again very soon. This was absolutely amazing. We made it with pillsbury gluten free flour blend and it was absolutely perfect. Love this recipe, easy to make and the family loves it!!! Delicious for Christmas morning! Made 6 large cupcakes with this recipe. Only adjustments were added 1/4 cup additional flour and used egg substitute and dairy-free chocolate chips since we have egg and dairy allergies. Turned out moist rich, and yummy! Kids loved them! Mum and dad did, too! Turned out so pretty that we made an extra batch to share with neighbors! Thanks! I love this recipe! I added a cup of chopped walnuts and make 4 minis. Perfect every time. You give the baker great instructions. 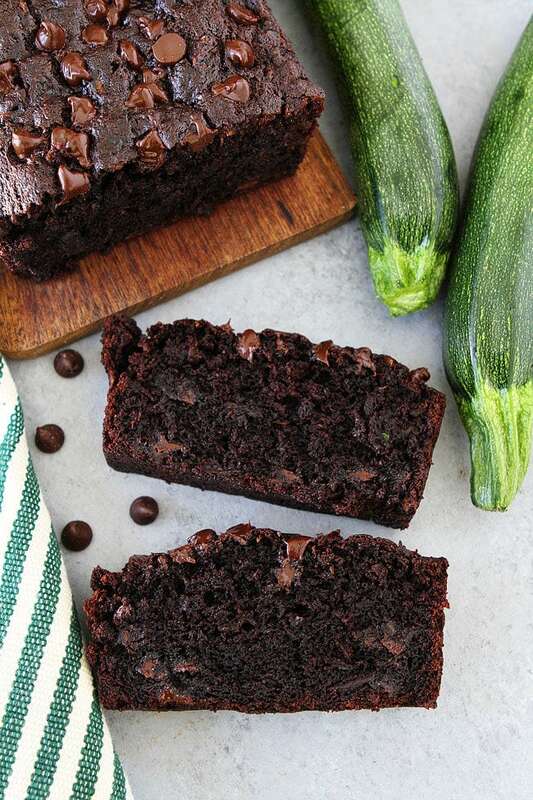 I had a similar chocolate zucchini bread at a restaurant recently and found myself craving it and wondering if I could recreate it today. I think I would cut the sugar to 1/2 a cup. Use no sugar applesauce in place of the butter. I may try it this way. Delicious recipe!! Moist, rich with a deep dark chocolate color! Will make this again for sure!